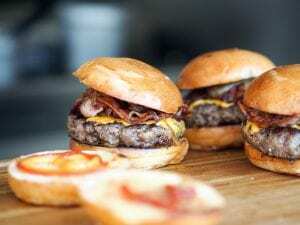 Dont fall victim to these common burger blunders that can take your grilling reputationfrom hero to zero very quickly. If you can, try and steer clear of supermarket shrink-wrapped, perfectly stamped burger patties. Sure, its convenient but you dont know kind of cuts have ended up there, not to mention all the hormones, antibiotics and chemicals have been added to the mix. Get ground meat from places you know you can trust (cough, cough. . . Us!). Our hamburger mincemeat mix has a great balance between lean and fat content, meaning juicy and tender patties without a fat overload. The only downside to using great, purpose made mince it that your guests will want to come over all the time. Youve been warned! There is not enough meat, so halfwaythrough the pattie making the cook panics and makes tiny ones by stealing meat from the right sized ones to make the meat go that little bit further. The patties end up looking like flat meatballs and even though the cook made them tiny, there is isnt enough to go around . . . Or . . .There is so much meat because the cook has slapped a wild number of patties on the grill. The cook then starts making the rounds trying to flog off the extra mountain of patties.Moral of the story, find out your number of attending guests, plan accordingly and get a little extra to cover for any last minute drop-ins. You can always freeze the mince its self if you find your self with too much. Plan ahead to avoid riots! You arent making a loaf of bread so dont be kneading the mixture. Less is more when it comes to patties. So, dont prework your meat by adding salt, spices and eggs etc, well in advance to when you make the patties. Add those things, gently mix and then go straight into making the patties. Try not to make the patty super compact and tight, allow the meat to gently clump together, enough that it wont fall apart but not too tight that is it solid. Be gentle, youll thank yourself later. Salt naturally draws out moisture so when you are making your patty mix, do not add salt because youll be left with meat that is dry and chewy. Only salt one side of the patty just before you drop the patty salted side down on the BBQ/Grill, let that side cook, season the other side, then flip it. Bam! Juicy patties comin up! This squeezes all the awesome juice that you worked so hard to keep in the meat, out onto the hot BBQ/Grill to be sizzled up. Sure, it might shave a minute or two off the cooking time, but it also shaves off taste and texture. Resist the squeeze!